“Integrity goes a Long way.” If you’re an Arkansas fan, you’ve heard or read this phase numerous times since the Petrino incident in April. 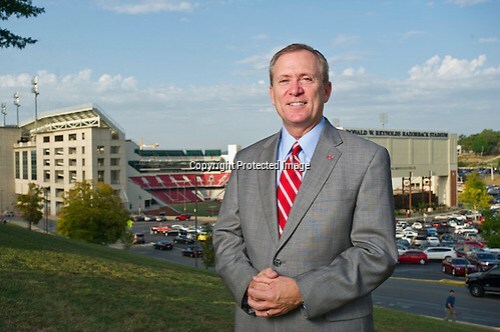 Well, I recently photographed Jeff Long for Ay Magazine and was really hoping to take images of Jeff away from the Razorbacks. He has been photographed for numerous publications since April, and I had ideas of getting him outside of his office and away from campus for this photo shoot. I had my location scouted, ideas in my head and I was ready to go. The afternoon before the shoot, I got a call that it had to be moved to the Broyles center to accommodate Jeff’s schedule. Well, hummm. I knew places that I did not want to photograph Jeff based on what appeared in other publications, but I had no idea of a new location. I spent time that afternoon trying to scout a new spot and I requested a copy of the story to try to spark a new idea because the old one just wasn’t going to work on campus. I ended up going to bed without a clear vision, which doesn’t always sit well. I met up with my creative director early the next morning and we worked through an idea up until we met up with Jeff. It wasn’t until Jeff stepped into the picture that my nerves actually calmed down. I think I had anxiety over this shoot because he has been photographed so many times recently, I used to photograph sports for the athletic department and I just wanted to make sure he looked good… this was kind of like photographing a friend. We picked a spot on the hill overlooking the stadium. I knew after 13 years of early morning football media days that the light would hit the stadium perfectly and add a great background to the photo. What I didn’t expect was the bright yellow construction crane to swing over the stadium precisely when Jeff stepped into my frame (thank goodness it was for a brief second), or the supportive fan to yell “We love you Jeff” as he passed by in a car. Photography is an adventure that is sometimes emotional. Whether it’s anxiety, desire to do well or a sleepless night, learning to take that energy and work it into the photo is a constant battle… but lately I think I’ve been winning.